On June 5 at approximately 9:00 a.m. the Calcasieu Parish Sheriff’s Office responded to a local hospital in reference to a patient arriving at the hospital that had been shot. When deputies arrived at the hospital they spoke with two witnesses who stated the victim was shot on the railroad tracks near the intersection of 13th Street and 3rd Avenue in Lake Charles. 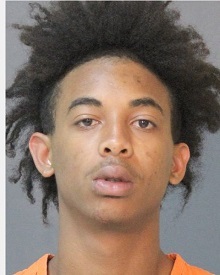 The witnesses also stated Octavious T. Dixon, 18, 1612 13th Street, Lake Charles, as well as two other individuals, approached the victim on the railroad tracks and Dixon then shot the victim with a handgun. All three suspects fled the scene. Through further investigation detectives learned the shooting victim has been involved in an ongoing dispute with a 16 year old family member of Dixon. It was learned earlier the same day, prior to the shooting, the 16 year old pointed a gun at the shooting victim and then fled the scene after witnesses pulled out their cellphones and attempted to video the incident. A short time later the 16 year old, Dixon, and another unknown individual returned to the railroad tracks, at which time the shooting took place. Later the same day Judge Robert Wyatt signed a warrant for attempted 2nd degree murder in the amount of $150,000 for Dixon’s arrest. CPSO detectives have attempted to locate Dixon, but have been unsuccessful. The Calcasieu Parish Sheriff’s Office is asking the public for assistance in locating him. If anyone knows Dixon’s whereabouts, or has any information in regards to the shooting please call CPSO lead Detective Casey Lafargue at (337) 491-3753 or Crime Stoppers at (337) 439-2222. If anyone is harboring or assisting Dixon in any way, they will be arrested and charged accordingly. Detectives located the juvenile and he was arrested and booked into the Juvenile Detention Center and charged with illegal possession of a handgun by a juvenile and aggravated assault with a firearm. The victim remains in the hospital in stable condition. The shooting is still under investigation and more arrests or charges are likely.